This is a simple side dish that you can throw together in a very short time if you have a food processor. If not, it takes a few minutes more, but I think its well worth the effort. I hand chop the veggies, and its really not that bad. I love a good slaw. You can serve it as a salad, stick it between 2 slices of bread for a simple sandwich or use it as an add on in a burger. Since I was making this for the barbecue party, I jazzed it up by adding some pine nuts. Feel free to leave it out or switch it for pumkin seeds, sunflower seeds, walnuts etc. Thats how simple it is. Enjoy!!! I'm also taking part in the Hearth & Soul hop and that's how I found your blog. Thanks for stopping by and taking the time to leave a comment Candace! Sounds delicious! 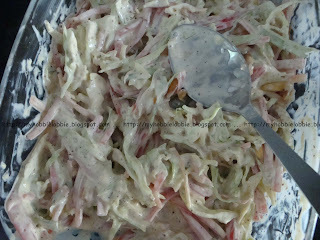 There is nothing like homemade coleslaw! Just stopping by from HearthNSoul and I wanted to invite you to my Iron Chef Challenge which starts tomorrow and the themed ingredient is canned tomatoes. Link up a recipe and you'll have a chance to win a prize. Hope you can join in the fun!!! Ott, A - i hope i can! Hi Trisha! I want to personally welcome you to the hearth and soul hop! I am now following your blog. 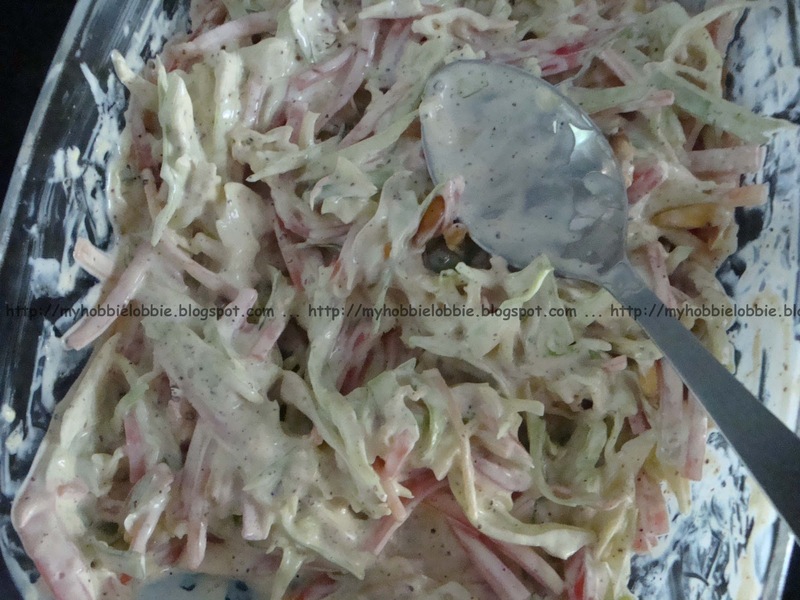 Cole slaw is such a personal thing and there are so many different variations. I like how you added pine nuts to yours. This certainly would change it up and I am going to have to try this recipe very soon. Thanks again for sharing it with us on the hearth and soul hop. All the best, alex! i do love cole slaw! than you for sharing with tuesday night supper club...and welcome back! I like a simple slaw - and I love your addition of pinenuts - yum! Thank you for sharing this us at the Hearth and Soul Hop! Trisha, I love Cole Slaw, but have never made it myself. Well, I'm certainly going to have to try it now. I love the fact that yours has pine nuts! Thank you for always having a wonderful recipe to share at "A Little Birdie Told Me..."!